In order to build a Native Application, you will need to have the SDK environments setup on your machine for each targeted mobile platform that you wish to support. In order for RhoStudio to build the final application, these environments must be setup properly and then RhoStudio will need need to know the paths to the build components. In the RhoMobile Suite installation instructions, review the Java Development Kit instructions for your operating system. Once you have Rhodes, you will need the SDKs for the platform you want to build your app on. These instructions are found here. This will prompt you for where you installed the SDKs for the various platforms. The installation script will display its best guess as to where the SDK is. You can then enter a new location, or leave it blank to use the suggestion. If you are not building for a specific platform (for example, you can’t build for the iPhone on Windows), you can leave that SDK location blank. You can find prerequisites for each platform here. The New Project window opens. 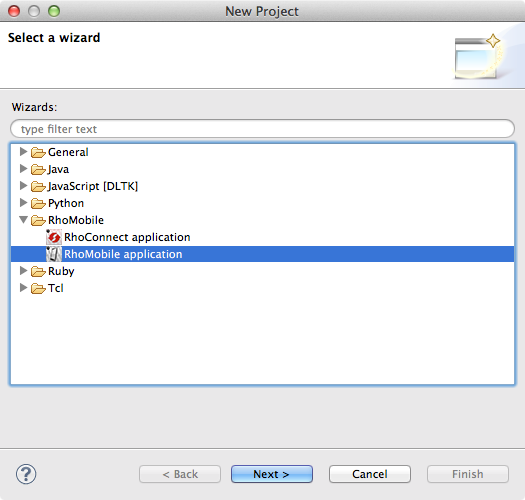 Select the RhoMobile: RhoMobile application wizard and click the Next button. 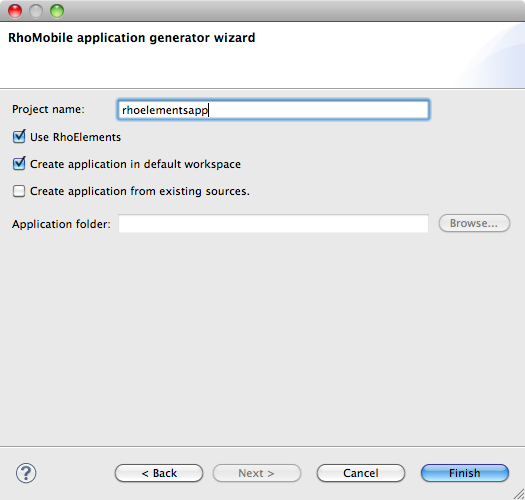 Enter the name for your RhoElements application in Project name; in this case, “rhoelementsapp”. You may specify a specific folder for your destination where your project is stored, by default, the destination is your workspace folder. Click the checkbox for the RhoElements application type. After pressing the Finish button, you’ll see the RhoElements app generator script output in the output console (Rhomobile build console). After you generate a RhoElements native application in RhoStudio, you can add a model to it, along with the associated Controller and View templates. You do this in the same way that you would for a Rhodes application: right-click on the application project in the Project Explorer and select New->RhoMobile model. See Adding a Model to a Rhodes Application from RhoStudio for a more detailed discussion. The build.yml file for your application manages your RhoElements build time configuration. Double click on ‘build.yml’ item in your project tree to open the build.yml editor. In the editor you’ll see two tabs: Rhobuild setting for the WYSIWIG editor, and build.yml for the text editor. You can add capabilities to your application, such as camera and vibrate, by pressing the Capabilities: Add button, selecting the capabilities from the popup window, and clicking the Ok button. The selected application capabilities will appear in the Capabilities: text field in the WISIWIG editor. You need to perform some additional steps before you build and run a RhoElements application on Zebra Mobile devices. After those additional steps, you can follow essentially the same instructions as you would for a Rhodes application, as shown below. You need to edit your build.yml file before you build and run a RhoElements application on non-Zebra Mobile devices. After those additional steps, you can follow essentially the same instructions as you would for a Rhodes application, as shown below. 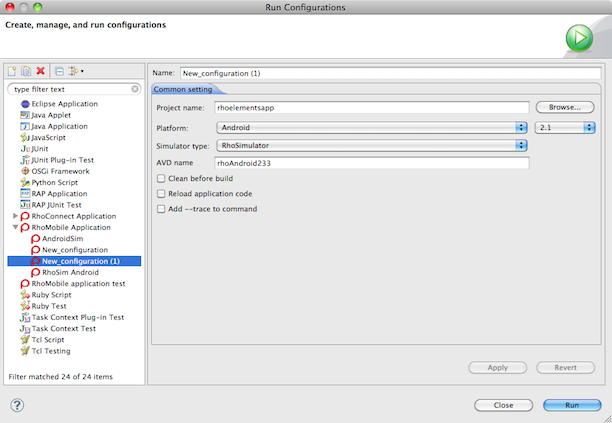 To start the build process in RhoStudio, create a Run Configuration: select your project in the Project Explorer, and select Run->Run Configurations… from the menu. The Run Configurations window appears. To create a new build configuration for your application, select RhoMobile Application. Then either right-click on RhoMobile Application or click the New button. A new configuration appears under RhoMobile Application. Select your platform and simulator type, and click Run to run your application. You can build RhoElements native applications for Zebra devices by performing some additional steps. The Zebra devices run Windows Mobile, Windows CE, and Android. RhoElements applications will not work in the case of an incorrect network setup on a Windows Mobile device, because RhoElements relies on localhost hostname and 127.0.0.1 IP-address presence. In general, when connected to a PC, the device should have Internet connectivity: e.g. the user should be able to browse web with Internet Explorer from the Windows Mobile device. In case of broken Internet connectivity, make sure that at Settings » Connections » Connections » Advanced » Select Networks the value My ISP is selected in both select boxes. To build for Zebra Windows Mobile devices, you can create a run configuration in RhoStudio, choose Windows Mobile as the platform, and click the Run button. For detailed instructions on building and running on Windows Mobile, such as prerequisite software and setting SDK paths, refer to the Rhodes build instructions for Windows Mobile. To build for Zebra Windows CE devices, you can create a run configuration in RhoStudio, choose Windows Mobile as the platform, and click the Run button. For detailed instructions on building and running on Windows Mobile, such as prerequisite software and setting SDK paths, refer to the Rhodes build instructions for Windows Mobile. Additionally, you need to install MC3000c50b PSDK from the Symbol support site. Then add MC3000c50b to your application’s build.yml file. On the ET1 device, define Symbol USB vendor ID (0x05e0) in (user_profile)/.android/adb_usb.ini. To build for Zebra Android ET1 devices, you can create a run configuration in RhoStudio, choose Android 2.3.4 as the platform, and click the Run button. For detailed instructions on building and running on Android, such as prerequisite software and setting SDK paths, refer to the Rhodes build instructions for Android. You can build RhoElements applications that will run on devices other than Zebra devices. To build a RhoElements application for a non-Zebra device on Android, Windows CE, or Windows Mobile, add the following to your application’s build.yml file. This application will use the Rhodes device capabilities but will provide the Zebra Webkit as the rendering engine (Android, Windows Mobile, Windows CE devices only). Then you can create a run configuration in RhoStudio for Windows Mobile or Android, and click the Run button. For detailed instructions, such as prerequisite software and setting SDK paths, refer to the Rhodes build instructions for Android or for Windows Mobile. To build a RhoElements application for iPhone/iPad, have app_type set to rhoelements in build.yml. Then you can use the same instructions for building a Rhodes application for iPhone/iPad. 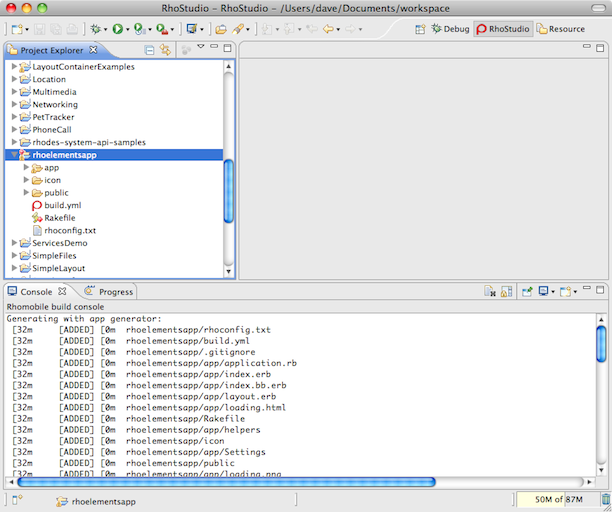 To build a RhoElements application for Blackberry, have app_type set to rhoelements in build.yml. Then you can use the same instructions for building a Rhodes application for BlackBerry. For iOS or Blackberry, you must edit your build.yml file each time you build to ensure that app_type is set to rhoelements. After application type change in build.yml it is required to run rake clean:wm and/or rake clean:android respectively from command line in the application folder, or check 'Clean before build' option in the respective Run Configuration(s). This indicates that your application will be a “RhoElements” application. This application type by default uses the Zebra Webkit as the rendering engine for your application interface. It also exposes an extended set of RhoElements APIs. If you build your application without this parameter, only the APIs that are indicated as RHODES will be available and the default rendering engine will be unique to the native operating system that the application is deployed on. A license is required to run a RhoElements application. On Non-Zebra devices that are running Android, iOS or Blackberry operating systems, you cannot license the application from the device. You will need to include the licensing information as part of the build process. A ‘Deployment License’ is needed and the following information should be provided in the application’s build.yml file. When the application is started, the license is checked for validity. If the license is invalid, the user will be notified and have to acknowledge before proceeding. You may obtain this information from the Software Licensing Server. After logging into the server you will see your license information on the ‘Deployment License’ tab. For Zebra devices and Non-Zebra devices that run Windows Mobile or Windows CE, the license cannot be obtained directly from the device or pre-bundled with the application. For these devices, you may either apply the license directly from the device using the licensing wizard's Manual or Internet methods. See the RhoElements Licensing page for more information. In conditions where you may have a traditional Rhodes application but would like to utilize the Zebra Webkit on Windows Mobile, Windows CE, or Android devices, add the Zebra browser capability to your application’s build.yml file. If you use the above setting without specifying app_type: rhoelements, RUBY RHOELEMENTS APIs will not be available. If you are planning on building multiple applications to be run on the same device, you can optionally choose to build your application in what is called “shared mode”. Common libraries from a RhoElements Runtime is stored only once on a device in a predefined location. Each application then uses this shared location for the core libraries and the application’s device footprint will only include the application specific code. This will result in not duplicating common code and consuming extra memory as well as produce faster compile times for each application. There are two steps to this setup. Install the RhoElements Runtime (can be done once). Build the application and indicate at build time that shared mode will be used. The RhoElements Runtime is only available on Zebra Technologies devices. This is a more complicated setup that involves coordination at build and run times. It should be meant for scenarios that have multiple RhoElements applications running on the same device where you could be concerned about memory limitations. Failure to properly build and deploy will result in a non-functioning application. The runtime application must be installed to the primary disk partition on the Windows CE/Mobile device, i.e. it has to be installed to `\Program Files\RhoElements` only. On Windows Mobile, the Device option must be selected when the installer asks for the location to install. On Windows CE, the default path (\Program Files\RhoElements) must be selected. All RhoStudio or rake commands will then automatically build your application in shared mode. Windows CE and Windows Mobile: Follow the build instructions for Windows Mobile. Android ET1: Follow the build instructions for Android. You must install your RhoElements native application that uses shared mode to the primary disk partition of the Windows CE/Mobile device, i.e. install to `\Program Files\<app-name>` only. On Windows Mobile, you must select the Device option when the installer asks for the location to install. On Windows CE, you must select the default path (\Program Files\&lt;app-name&gt;). Start Menu if the application is installed from the .cab file or by a rake run:wm:device:cab command. application folder if the application is installed by a rake run:wm:device command. The generated .lnk is a standard Windows Mobile/CE shortcut file having the following format: <line-length>#"<runtime-exe>" -approot="<app-folder>"? "<icon-path>"
If the -approot parameter is not present, then the value from Configuration > Applications > Application > General > StartPage tag of the RhoElements Runtime configuration file will be used as the start page parameter (usually it points to ‘Welcome to Zebra RhoElements’ page). You can include a custom RhoElements configuration file Config.xml in your native application bundle. This only works on Windows Mobile and Android with Zebra WebKit. It does not work with RhoSimulator. The only sections of Config.xml used in a native application are related to webkit and plug-in, such as specifying a user agent string. The Logger section and the startpath are ignored. Copy the original Config.xml file from the RhoElements gem on your development computer: gems\rhoelements-<version number>\libs\data\Config\Config.xml. Place the copy into another location on your development computer, such as in your application root directory. Customize the copied Config.xml as needed. The RhoElements native application log is configured via the rhoconfig.txt, located in the app source root folder. By default the log file has name rholog.txt and placed at the following location: * Windows Mobile/CE: rho folder of the application folder. * Android: rhodata folder of the application folder (accessible at emulator or rooted device only). You can use the logserver parameter to send the log to the host via HTTP. There is no option to store the log file on the mobile device in this case. If you start your application with rake, then the log file is additionally stored at the app source root folder. In this case, the name of the log file is defined in build.yml with the applog parameter (by default the log file name is rholog.txt). See enable HTTP-logging with a help of rhologurl parameter in rhoconfig.txt. 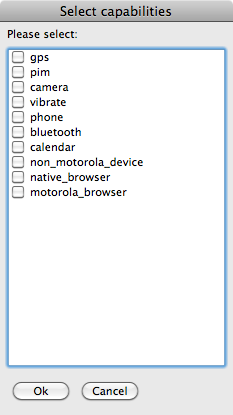 On devices that are not rooted, like the Zebra ET1, the rhodata folder is not typically accessible through USB. You can change the location of the log file if you wish to have easy access to it. Add the LogFilePath parameter to rhoconfig.txt (feel free to change the path). Then in build.yml, add the sd card to capabilities. 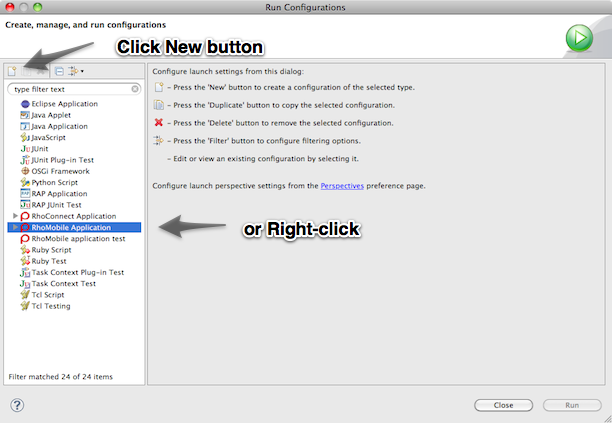 You can use the Rhodes instructions for how to set application name and icon and upgrading an application. A RhoElements native application uses the Rhodes gem: by default, that is the latest Rhodes gem installed on your computer. You can use the Rhodes instructions for setting up build.yml to use a different version of the Rhodes gem.